Order our PRE-PUBLICATION sale and be the first to use this exciting new data set! Get it all in one easy picture! 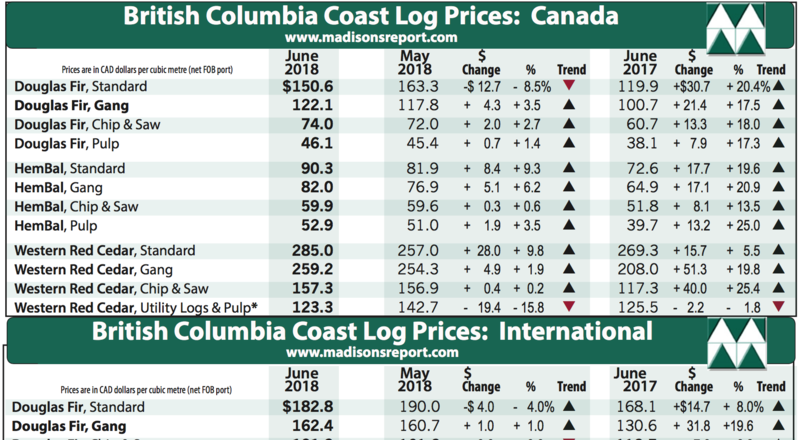 Madison’s BC Log Price Report provides valuable insight combined with the latest prices of west coast Canadian log sales, with striking graphs and charts to illustrate our point. British Columbia coastal log prices of various species and grades, for both Canadian and international markets, from January 2008 – March 2018 and monthly updates going forward. Be the first to GET THE LATEST DATA of sales prices on BC coast Cedar, Douglas fir, and HemBal logs in standard, chip & saw, gang, and pulp grades. We can’t wait for you to see this new data! Madison’s Monthly BC Log Prices Data Set In One Tasty Bite! !